"Looking for a healthy version of mac and cheese? This is it! 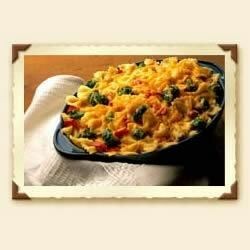 Mixed vegetables and Sargento Shredded Reduced Fat Cheddar cheese  yum!" Melt butter in large saucepan over medium heat. Add garlic; cook 2 minutes. Add flour; cook and stir 1 minute. Add milk, salt and pepper sauce. Heat to a boil, stirring constantly. Remove from heat; stir in 1 cup cheese until melted. Add sauce and vegetables to pasta; toss well. Transfer to a greased medium baking dish or oval casserole. Cover with foil; bake in preheated 375 degrees F oven 15 minutes or until hot. Uncover and sprinkle with remaining cheese; bake 2 minutes more or until cheese is melted. I've never made mac and cheese before this, but we LOVE it. We don't use the garlic or hot pepper mainly because I have been out of it every time I make it, but it is one of our go to meals. A nice cheesy pasta. My kids liked it. You can customize veggies to your tastes. I topped with 1/2 c. cheddar and 1/2 c. parmesan cheese which added a bit more flavor.